Encore! is proud to present its production of this classic musical, running from March 12th through 18th 2012. West Side Story is widely considered one of the greatest achievements of the American musical theater. A version of Shakespeare’s Romeo and Juliet set in modern times, West Side Story tells of star-crossed lovers in the New York City slums of the 1950s: Maria, the Puerto Rican immigrant, and Tony, American-born. Their love is tragically thwarted because of the ethnic hatred between their communities. The lovers’ story, and the story of the rival Puerto Rican and American gangs (Sharks and Jets), is told through the thrilling use of words, music, and dance. The show was created by seasoned Broadway veterans at the height of their creative powers, along with relative newcomers (destined for future greatness): Jerome Robbins (director and choreographer), Leonard Bernstein (music), Stephen Sondheim (lyrics, to his first Broadway show), and Arthur Laurents (book, to his first musical). West Side Story was positively received by critics when it came out in 1957. Typical of the reviews was John Chapman’s from the New York Daily News: “The American theatre took a venturesome forward step… This is a bold new kind of musical theatre…It is, to me, extraordinarily exciting.” The show’s major cultural impact, however, was really only felt four years later, when the movie version of the musical achieved unprecedented success, winning 10 Oscars (including the award for Best Movie of 1961). Its music and lyrics, which in 1957 had been considered complex and perhaps overly sophisticated, achieved wide popular acceptance. Singers recorded versions of the show’s songs, and numbers like “Maria” and “Tonight” and “America“, became well-known classics of the American songbook. It is both because of this successful blending in the service of story-telling, as well as the emotional story that is told, that West Side Story has remained so beloved for more than 50 years. Last year, Encore! co-sponsored a youth production of the musical Grease, with Hadassah Centre Stage. The success of the show, staffed by young people, led to the formation of a youth division in Encore! 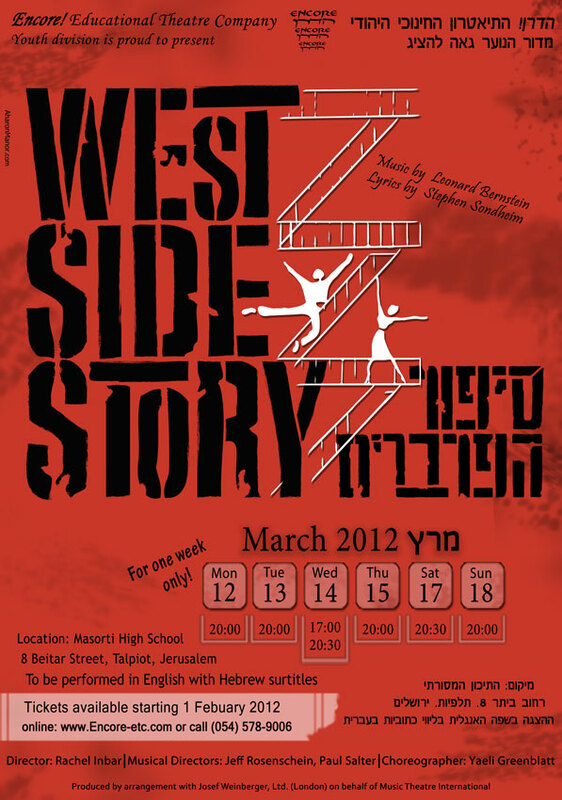 in order to present West Side Story this season, and other popular works in the future. The involvement of young people in every aspect of the production fulfills Encore’s goal of training the new generation in theatre crafts and appreciation of the musical theatre repertoire. In this way, Encore! aspires to perpetuate the tradition of musical theatre in youth.